Far easier for the Victor Meldrews of the audiophile world to dismiss the manufacturer aiming beyond the audiophile echo chamber as pandering to hipsters than it is to admit a new product worthy of (their) closer scrutiny. Doubly so when a product dares to challenge established thinking. Offering an alternative to passive loudspeakers powered by outboard amplifiers (once again) are Dynaudio. If we are to believe the Danish company’s promo shots, the 2017 revision of its Focus XD active loudspeaker range is aimed at younger folk than you’ll find at the average audio show. “No amplifier. No speaker cables. No compromise” runs the promo tagline. No hi-fi rack either. Just a sideboard and a pair of floorstanders. No compromise? 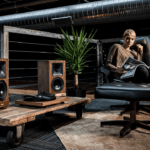 “All Focus XD speakers are digital from the source to the driver – and all can handle full-fat 24-bit/192kHz hi-res files through their entire signal path,” quoth the press release. Side note: the promo shot’s absence of power cables and interconnects is no more ad wo/man’s creative license than showing a turntable sharing the same shelf space as a pair of standmounts. 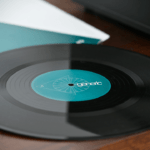 In the real world, turntables require isolation from speaker vibrations just as much as active loudspeakers each call upon mains power. The accompanying electronics live inside the speaker cabinets. Outta sight! In the bin – quite literally – go speaker cables, outboard amps and DACs. 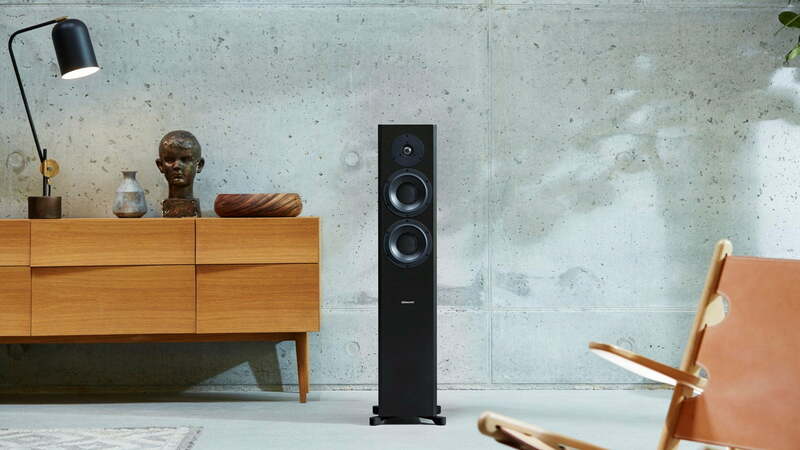 Dynaudio’s 2017 Focus XD range comprises three models: the XD 20 2-way standmount (€5500); the XD 30 2 ½-way compact floorstander (€8500); and the larger 3-way floorstanding Focus XD 60 (€11,000). Finishes? Satin white, black piano lacquer and high-gloss walnut veneer comes as standard. High-gloss rosewood veneer and high-gloss grey oak veneer attract a small premium. Were we to buy into one of Dynaudio’s passive models, how much extra cash would we need to set aside for third party amplification and D/A conversion? Doubtful that our total spend would be low enough to pass up on an active loudspeaker system’s all-in-one proposition and do so with confidence. Active detractors quite reasonably point to a speaker cabinet’s internal sound waves as one reason to keep its amplifiers as separate entities. But what if going active gave us performance gains that outweighed any vibration-induced losses? The theory is compelling. Ditto this commentator’s real life experiences with a range of active loudspeaker models. Without recourse to the manual, the single digital (S/PDIF) input and single digital (S/PDIF) interconnect (that joins left Focus XD loudspeaker to right) tells us that Dynaudio favour a digital crossover, one where frequency anomalies can be smoothed and phase distortion corrected using DSP. One per driver, each digital amplifier’s output can been tailored precisely to its partnering driver. From the press release: “The 2017 range has had a ground-up revamp of its signal-processing flow (incorporating elements from Dynaudio’s professional LYD range of studio monitors) for substantial improvements in sound quality. Dynaudio’s DSP can also be used to tailor the loudspeaker’s output according to room placement: freestanding; wall; corner. This story isn’t only about new hardware. 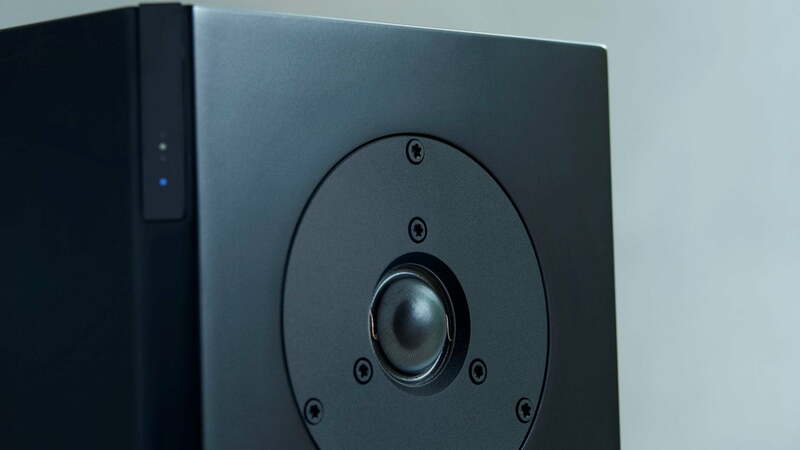 A firmware update applied via rear panel USB socket allows existing Focus XD owners to tap into the audible benefits of Dynaudio’s revised DSP code. Clearly, active loudspeakers are more than just an attempt to minimise a hi-fi system’s aesthetic intrusion and/or wallet damage. They’re about optimal sound quality too. And with companies like KEF, ELAC, Acoustic Energy, Genelec, Manger, Canton, Raumfeld and Avant Garde also aboard the active loudspeaker train, it’s only a matter of time before it rolls into a town near you. Further enthusiasm for the active way of thinking can be found in my first piece for Michael Lavorgna’s AudioStream here. If the Focus XD range is borrowing technology from the LYD range, why is it that the XD 20 2-way stand-mount costs €5,500 (about USD6,850) a pair, and the 3 way LYD 48 (with an 8 inch woofer!) costs USD2,300 a pair? That is almost 3 times more! The 3 way Focus XD 60 is around USD13,680 (€11,000). That is almost 6 times the price of the LYD 48. What is the justification for the price difference? Audiophile pricing???? Because the studio monitor is priced as a single monitor, the focus xd are per pair. Also, the Focus have more powerful amplification and a better inbuilt dac then the studio monitors. Rock, you are incorrect. The LYD 48 are $2,300 per PAIR. Can you please provide details about the better builtin dac and more powerful amplification? Also, how can that translate in 3-6X the price? Keep in mind that professional monitors are designed to withstand high SPLs and to provide a very accurate and transparent reproduction of audio signals, so I doubt that the LYDs are under powered when compared to the FX series. To me, sounds like the LYD 48 would be a great competitors to the LS50 wireless. Got the same feelings as Fred S.. The PROs simply don’t accept unreasonable pricing. I also think that Dynaudio in general produces big batches compared to others. I mean Dynaudio is in the big league of loudspeaker producers, so I would expect more margin to go to the one listening to the transducer(s). I considered the, not crazy priced, Focus160 some years ago but ended up with ATC SCM19. Not cheap either but somehow I feel that ATC maintains a reasonable price for their HiFi line-up. I would be surprised if ATC sells more units than Dynaudio. Besides production scale, perhaps the ‘middleman’ is the price issue. I believe Teufel and XTZ do have better pricing. Anyways there seems to be a trend going; loudspeaker producers going into (build-in) electronics. We’ve to see if it is for the good. At all times it is good to consider the amount that you pay for your beautiful frequencies. Srajan, thanks for the reply. You make an interesting point. You bring up musical instruments shops which I do frequent from time to time. What blows me away is that for less than what a pair of audiophile speaker cables cost, you could buy some fantastic musical instruments. There are cables out there that cost more than vintage 1950s-60s Gibson Les Pauls! Or a brand new baby grand piano! How can anyone justify that? It just blows my mind. I would like to see a detailed comparison between Dynaudio Focus xd 600 and kii three! Would anyone else be concerned that more complex units would be more prone to breaking? As it stands, my passive speakers are a few decades old–Will active speakers with a lot of complex electronics last as long? I also worry about having to replace the whole setup if one portion of the speaker–say the DAC–breaks. With a modular system, if my DAC is busted I can simply swap it out. Sure, the modular nature of a separates system means you can swap out faulty components as necessary. All-in-one means a fault means the whole system is out of action until it is repaired. Does this mean active’s amp is more likely to fault than a separate component? Of course not. Reliability is more likely to vary with manufacturer than topology. Curious that you never mention ATC actives. Any experience? I’ve Been interested in the 19 floorstanders lately. Thanks. ATC are name-checked in the AudioStream piece. 😉 However, my list of manufacturers here pertains to those making actives specifically aimed at home (and not only pro) users. I have the Dynaudio Excite 14A active speakers. Unlike the KEF LS50 Wireless speakers, the Dynaudios come out of sleep mode automatically and they play gapless without any problems. And the sound is superb with everything I have tried, including electronic, rock, alternative, blues, jazz, singer-songwriter, and folk. Amazon has them for $1,600 U.S.
Just add a DAC and that’s it (I also have a Jitterbug and a subwoofer). Couldnt agree more — if Dynaudio’s marketing mavens insist on showing us something other than the speakers, give me someone real (or a reasonable facsimile thereof) sitting at a mixing console with a pair of actives from their Pro line. I realise that isnt the lifestyle market these speakers are aimed at, but they’re inviting ridicule with this imagery. I have no problem with Darko showing us his furniture etc in various rants, but I have little time for marketing fluff, regardless of the technical merit of the speakers mentioned here. How many Dark regulars, assuming our budgets stretched this far, would opt for these over something where function accounted for more of the Bill of Materials than form ? Spend the money on design and execution, please – if that means a result closer to ATC than B&O, so be it. More seriously, active options like this present a serious challenge to conventional audiophile thinking that a) passive crossovers driven by outboard amps are always better (…they’re not) and b) that good-looking minimalist setups can’t possibly sound good – that doing it tough with numerous boxes and eel-like cables is a badge of audiophile honour (…they can and it isn’t). If active loudspeakers like this are good enough for studio engineers to mix and master our favourite albums, why are they not good enough for in-home playback? Poo-poo-ing setups like this is snobbery, plain and simple. And I’d also contend that snobbery is what suffocates interest from newcomers thinking about investing in their first hifi system. Snobbery is what keeps the audiophile world walled into its clique of cashed-up middle-aged white dudes. Jeez, how depressing it is to be surrounded by cashed-up middle-aged white dudes only; and always. Cmon John – neither of us criticised the technology or even the speakers themselves : I believe I specifically mentioned ‘ATC actives’ in my reply – but I *get* that you’re passionate about this ‘evolution’. We can ‘poo-poo’ the marketing to our heart’s content without impacting newcomer’s interest in getting good sound without the mess of gear you allude to (esp cables). 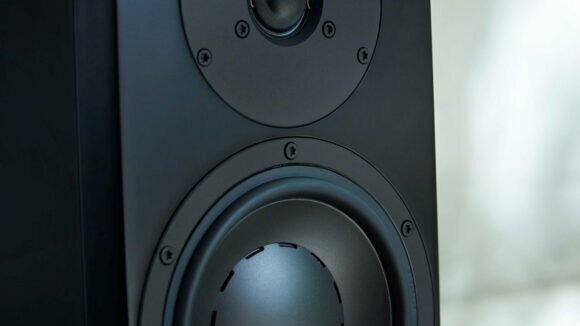 Srajan makes some very good points above re what do we do when the DAC or amp fails in an active speaker, arguably a much more relevant post than mine, but I stand by what I said about the direction Dynaudio appear to be taking with these speakers. Ultimately, they’re the ones who have to move product – I just hope you focus more on their pro and audiophile offerings in future. My point is that the audiophile world, like any self re-enforcing bubble, is highly resistant to change and that poking fun at the marketing material provides an easy out for those who sense the engineering rumble in terra firma. At least I wasn’t the only who thought the photo screamed hipsters. The lack of the two smiling could be for many reasons…. I like studio monitors. I had ADAM A5 in my main stereo set-up and simple loved the high frequencies from that ribbon. Now they make noise in the office, great purchase it was and still is. My only issue is the connections with studio monitors. I feel that with passive speakers it looks better to have just speaker wire running to your monitor. With the ADAMs I had the power cords and signal cables. I always wonder where the power cables go in the advertisement pictures of wireless active loudspeakers…. This makes me wish KEF would make a floor standing version of the LS50 Wireless. I love what Dynaudio built but it’s more than I want to spend. Alternatively, one could add a subwoofer to a pair of active monitors. I hear ya. Much as I’d love XD 60’s, LS50W’s are on the top of my list. I’ve got a 24×28 room and have some concern they’d be enough granted I don’t play that loud. I also like all the digital magic (crossovers etc) happening in one box. Xeo 6’s are also on my list to check out but they’re small floor standers. Other direction is Tekton Double Impact but of course they’re not active.